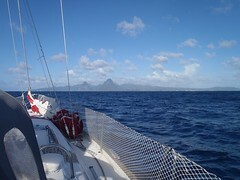 This was our first view of St. Lucia as we arrived from the South passing by St. Vincent earlier in the day. The crossing between the islands was a bit rough (video to come) but was about as predicted. It turns out we picked our weather window well as those we spoke to who arrived before and after us had a much rougher trip. By this point in the passage we decided to stop using our genoa as we could no longer furl it. It's lashed to the deck on the bow where it stayed until Austin and I went up the mast to tighten the screws holding the seconds of the furling foil together. We were waiting with baited breath to hear of your safe arrival/anchorage in Rodney Bay and now you've been on/near St Lucia for several weeks! It looks like a lovely place and it seems you've made many friends. Have you done any "island explores" to inland sites/sights such as water falls? It's the strangest thing but we've hardly gone more than a KM inland in all this time! We have plans now to change that this week but it depends on people getting better first.